Go tropical this season with our bright jewel coloured wooden Christmas trees. Each small, medium or large pack contains eight hand painted laser cut Christmas trees.. 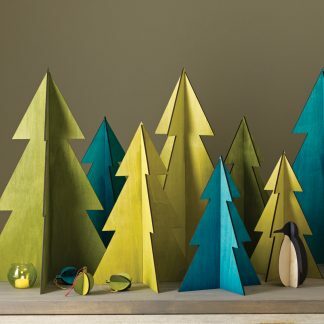 The hand painted wooden trees will arrive in bright shades of orange, green, blue, red, purple and pink. A selection of different sized packs would look incredible dotted down the middle of your table or slide a thin piece of card into the top of the smaller tree to create personalised place settings. The trees arrive packed flat so will be the perfect seasonal accessory to take with you if you are jetting away somewhere hot this holiday season. Available in small, medium, large or mixed (containing 2 x large, 4 x medium and 6 x small trees in a variety of colours). 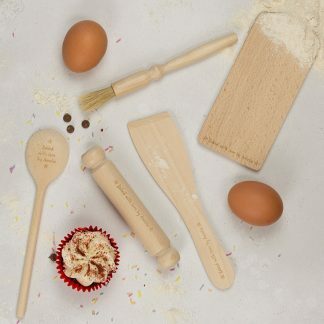 Designed and handmade with love in our Hampshire workshop.